One of the most important design elements your pool can have is safety. 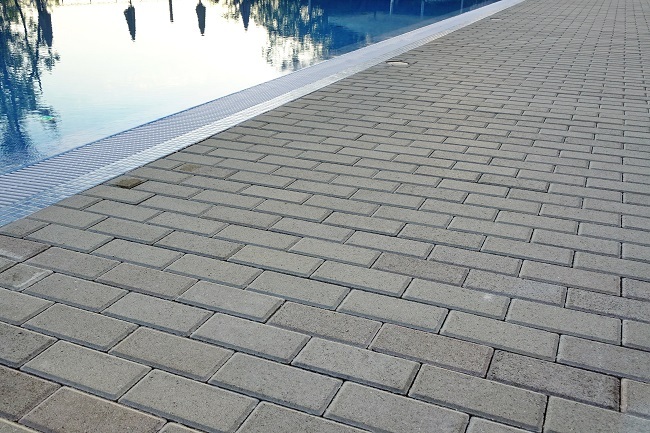 When people are running in and out of the pool, water is going to get into the surfaces of your pool deck and patio. Chlorinated water is especially slippery. So look for a deck coating that has plenty of pockets and crevices to reduce standing water. Flagstone is in style, and you don’t have to completely rip up your patio to get it. If you have a solid concrete patio, you can order a custom overlay that gives you the contemporary look you want. Flagstones match with most Texas properties, and they also offset stains for years of parties and backyard barbecues. Your outdoor living space is going to have a lot of distinct features. These can include a patio, your swimming pool and hot tubs, and an outdoor kitchen. Make sure these features are connected by concrete or paver pathways. That integrates all of the features together to make your backyard design look more intentional, even if you’re adding new features over time. It also means no one has to step on the grass. Texas is home to lots of vicious fire ants, and pavers keep them away from your guests’ bare feet. Bring decorative elements into your backyard, not just functional ones. Natural stones and river rocks can add a peaceful thematic finish to your new backyard. Incorporate waterfalls, rock gardens, and plant arrangements so your yard looks and feels like an oasis. Contact us here to get started on your custom pool.